The myth of the Weaver Girl and the Cowherd originally comes form China, and is popular throughout East Asia. It tells of separated lovers who become the stars Altair and Vega. These two stars are kept apart by the "River of Heaven" or Milky Way but are allowed to meet on one side of the river on the seventh day of the seventh month each year. This story is is the basis of the Qixi Festival in China, the Tanabata Festival in Japan, and the Chilseok Festival in Korea. Chingnyo (Weaver Woman is a hauntingly magical and imagistic short story written by Korean writer O-Chonghui, who has been referred to by Korean literary scholar Dr. Bruce Fulton as "the elder stateswoman of Korean literature." It is a contemporary retelling of the Weaver Girl and Cowherd myth, but embraces the loneliness and tension of relationships, separation and social expectations. O's story depicts a woman in a modern apartment looking out her window waiting for her husband, and the reader travels through her eyes, memory and imagination. Miseli Jeon's gorgeous translation of O's story has been published in a collection of Korean short stories Waxen Wings. 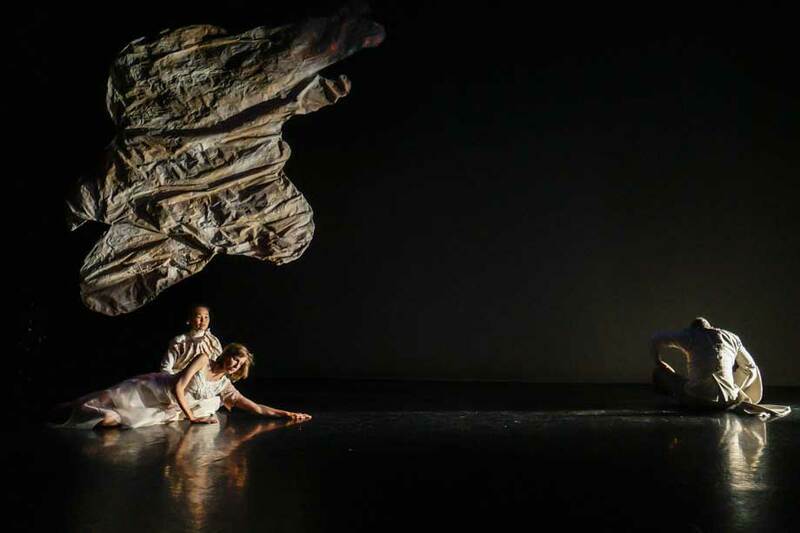 Weaver Woman is a dance-theatre project that involves movement, text, music and visual art. It is choreographed and performed by TomoeArts Artistic Director Colleen Lanki, working in collaboration with dancer-actor Matthew Romantini. Colleen is a specialist in nihon buyoh (Japanese classical dance) and Matthew is an expert in transforming literary works into performance. The choreography is based on a nihon buyoh (Japanese classical dance) vocabulary and aesthetic combined with expressive movement and gesture. The music for Weaver Woman is composed by Lan Tung for erhu (Chinese lap fiddle), voice, percussion, and cello. Lan is an internationally renowned composer and musician and the leader of the Orchid Ensemble. The music is performed live. Actor and playwright Maki Yi performs the text and acts as dramaturge on the project. Maki is an interdisciplinary artist, and fluent in English and Korean. These four core artists met for a creation workshop in July 2013, culminating in a sharing of 40 minutes of material they had created or improvised over the week of work. They were joined by designer Ines Ortner for a concert performance in summer 2014 (see below). In November 2014, these five artists participated in a script creation workshop and "Performance as Translation" research project with Dr. Christina Yi, Asian Studies, UBC. Here they put together the performance "script" for an eventual full production. 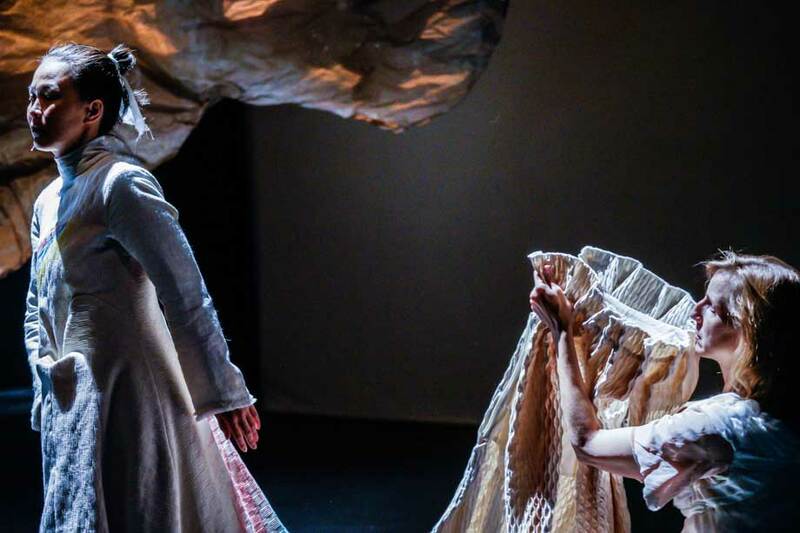 For the full production of Weaver Woman the story's magical images are enhanced through integrated visual design. 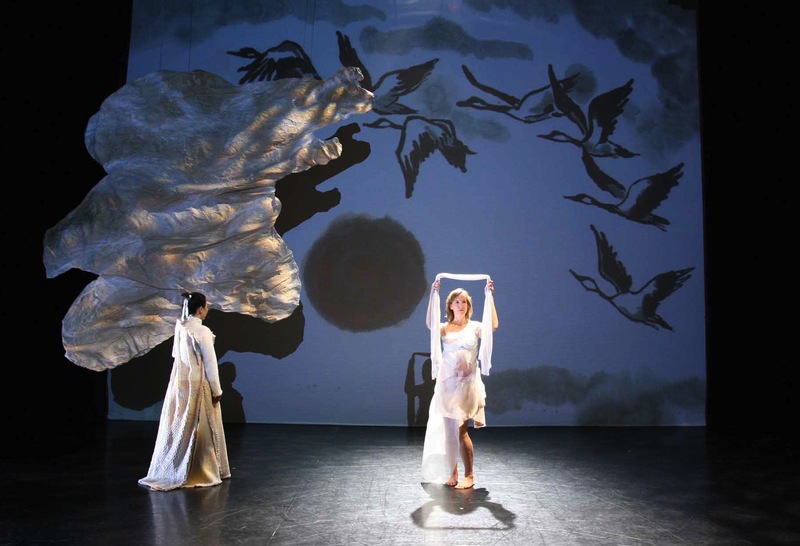 Japanese calligrapher and watercolour artist Etsu Essence Inoue has created a dozen painting that have been transformed into projected backgrounds by Chengyan Boon. Designer and textile artist Ines Ortner has created intricate costumes and a hanging sculpture to create the world of Weaver Woman.. The show's visual world is brought to life by Gerald King's stunning lighting design. On July 17, 2014 the group performed "fragments" of the show at the Dr. Sun Yat Sen Classical Chinese Garden as part of their Enchanted Evening Series, amid gorgeous surroundings of elegant latticework doors, stone courtyards, ponds, maples, and bamboo. 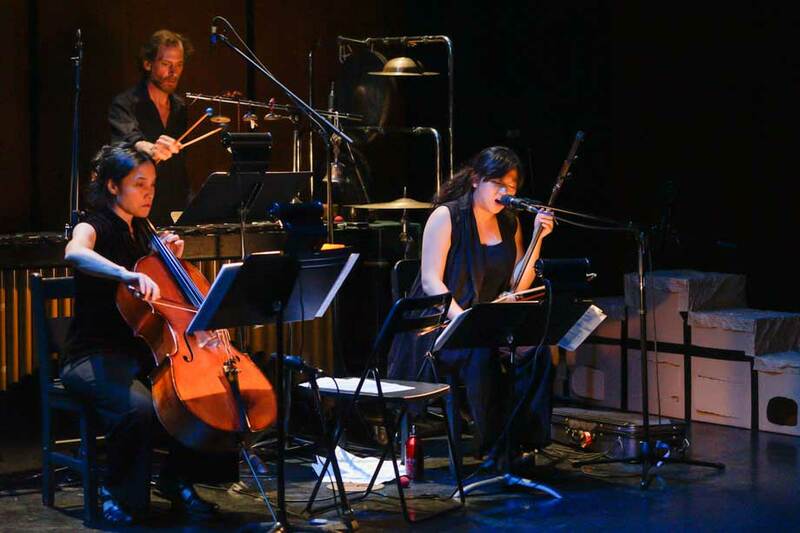 The show was done as a concert of pieces: fragments of the text spoken by Maki Yi, dance and movement by Colleen Lanki and Matthew Romantini, music by members of the Orchid Ensemble with special guest, cellist Peggy Lee,featuring new compositions by Lan Tung. Ines Ortner created stunning "prototype" costumes (which were much more than prototypes!). The sky was clear and full of stars, the atmosphere perfect and even the resident bullfrog made an appearance at a ideal moment. It was a magical evening and a fantastic step in the creative process of this show. 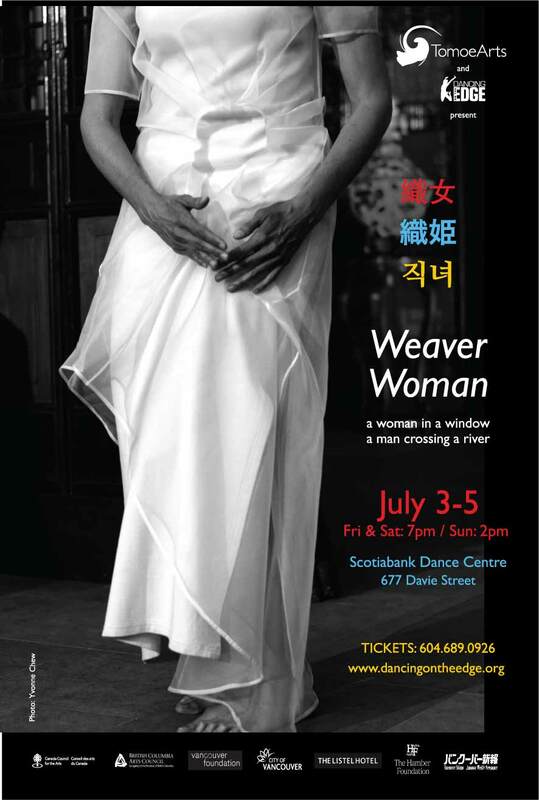 The world premiere of the full production of Weaver Woman was on July 3-5, 2015, at the Scotiabank Dance Centre as part of the 27th Annual Dancing on the Edge Festival. This was the culmination of two years of preparation and rehearsal, and the first time all the elements of the production were brought together. Maki Yi and Colleen Lanki both portrayed "The Woman" - Maki providing the vocal narrative and Colleen dancing the woman's memories, emotions and visions. Matthew was "The Man" - a man crossing the bridge, the man she is married to, the man she sees from her window. Music was played live by Lan Tung, Peggy Lee and Jonathan Bernard. All the scenic and visual design laments were in place, created by the fabulous design team: Ines Ortner, Etsu Essence Inoue, Gerald King and Chengyan Boon. We were confronted by a sky full of forest fire smoke, a power outage in the theatre, and a weekend full of events in Vancouver, but our beautiful, elegant show prevailed, with amazing responses from all who came to share the magic. photos by: Yvonne Chew, Alfonso Arnold and Ines Ortner.